Last summer in Colorado Springs, the temperature reached 101 degrees. Most days we’re blessed around here with great weather, but when it climbs into the mid-90s and beyond, we’re getting into some dangerous heat. And heat can kill. Each year more people in the U.S. die of heat than all other natural disasters combined. It’s the heat waves that get us. Our bodies take a week or two to adapt to temperature changes, and a sudden change doesn’t give us a chance to do that. The best thing to do during a heat wave is stay in the air-conditioning. But what if, like many here in the Springs, you don’t have it? Most days you can open the windows and turn on the ceiling fan, and that works just fine. But here’s the thing you need to know about fans. When the temperature hits the mid-90s and beyond, they may make you feel cooler, but they do nothing to cool down your core body temperature. Keeping your core from getting too hot is how to keep your organs functioning. They like to stay around good ol’ 98.6, give or take a couple of degrees. You don’t have to be doing hard labor to be at risk in the heat. Even at rest your body produces quite a bit of heat from various metabolic functions. 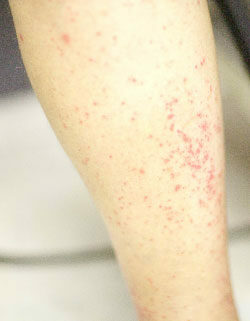 Excess heat gets expelled via blood vessels. It travels to near the skin surface and escapes. But for that to happen the air touching your skin has to be cooler than the heat escaping it. And air temperature in the mid-90s is not cool enough. Even sweat evaporating off your skin doesn’t help in these high temperatures. Neither does circulating that hot air with a fan. Some people think fans can even make your core hotter by constantly bombarding your body with the surrounding hot air. So what’s a person to do? Well, you could run your fan over some ice. Better yet, visit a nice, air-conditioned shop or mall. How about a drive in an air-conditioned car? Or maybe it’s time to visit a friend—who has air-conditioning. Also remember to stay hydrated. Drink cool, noncaffeinated liquids throughout the day. Lots of them. There’s no need to add salt unless you’re planning some heavy exercise, and then just a tad will do you. Consider taking a couple of cool baths or showers during the day. And be sure to check on elderly neighbors or those with health problems. Not only do they not tolerate the heat as well, but older folks tend to have fewer warning signs that they’re getting too hot—or ignore the ones they have. Unless prompted, many older people don’t drink enough fluids. And they tend to be a little more susceptible to one of the common warning signs: confusion. If you’re confused sometimes you don’t act appropriately. You may think you need to cover up when you get too hot. And please don’t forget babies. I think we all know that a few minutes cooped up in a hot car can kill, but check their bedrooms too. Remember the thing about fans. Keep babies hydrated. And, whatever it takes, keep them cool. If you or someone else develops signs of heat exhaustion, such as nausea, muscle cramps, dizziness, headaches, inappropriately cool skin or confusion, to name a few, do whatever it takes to cool off immediately, whether that means getting to air-conditioning or soaking yourself with cool water. Because the next step is heat stroke. And that kills a lot of people.